Sorry for not updating the blog for a few days,I’ve been busy at work most of the time. Everyone in Islam knows that during Ramadan it’s a test of faith,a test of passion,a test of patience and how we have nothing holding us back,we must be the better person in any situation and be patient enough to have faith, passionate enough to care through out any struggle. 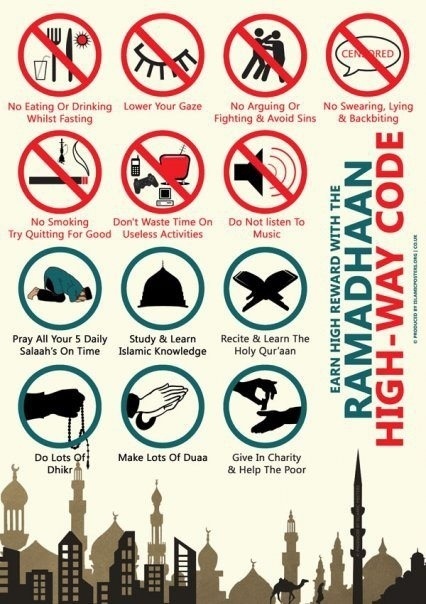 Ramadan is what I believe when Allah pushes you to the limit,it’s the most sensitive month for a lot of people. I have experienced almost every year that my family would seem to start off great,then half way there experience a problem,which would in turn make everyone’s anger am sensitivity heightened since we are not eating/drinking. Then in the end we all realize what we have done during Ramadan and always ask Allah for forgiveness. I’m pretty sure everyone has experienced this with their family,everyone’s angry,not everyone shows up to eat in the morning or night since someone is mad at another. MY ADVICE: stay humble,stay calm,be patient & remember that these are people you love and care about,even though sometimes you feel they have no brain and are acting improper. The only thing we can do is either try and help the situation by making sure everyone is calm and figure out a compromise,stay out of it if it doesn’t affect you or isn’t a really big deal,never take sides and be the middle person,look through the Hadiths and sayings of all the Prophets(peace be upon them all); try and tell everyone out of love that we shouldn’t even be arguing because it’s Ramadan and Allah wants us to restrain from these things and be pious. On to my diet part of the blog, I’ve been eating brown rice in the morning along with some type of protein. Then I too it off with smart balance non fat,omega 3 packed milk and Fiber One Cheerios with barely any sugar per serving. Also a bottle of water and a huge cup of green tea. This holds me for the 17 hours in front of the grill until Iftar which I have been eating 5 ounces of grilled chicken breast and more brown rice.